The Board of Visitors authorized the establishment of a branch campus in Incheon, South Korea at a recent board meeting on Oct. 3. Mason was approached by a Songdo Project representative in 2008 and was asked to consider the possibility of establishing a branch of the proposed “Songdo Global University” in Korea. The Songdo Global University Campus is designed to be a global hub for education, economics, politics, research and culture. Many groups participated in the evaluation process in order to authorize the campus. These participants include members of Mason’s senior leadership, the faculty senate and focus groups with students at Mason and in Korea. Interviews were also held with key international leaders. Anne Schiller, Vice President for Global Strategies and Professor of Anthropology at Mason, was involved in the decision-making process. She is one of many who believe this opportunity has the potential to be very beneficial to Mason. “Mason’s 2014 strategic plan described East Asia as a geographic region of particular interest to Mason,” Schiller said. It is projected that U.S. undergraduate students will be able to begin studying at this campus in 2014. The initial Mason-affiliated majors offered will be in management and economics, and in the following year Global Affairs will be introduced. 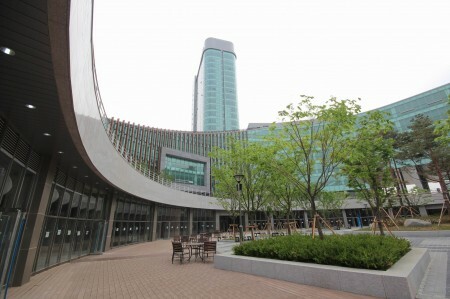 Students will also have the opportunity to enroll in classes in universities neighboring the Songdo campus. More programs, as well as graduate degrees, will be offered in following terms. This opportunity will further enhance Mason’s attempts to become a global and innovative university. “The Songdo campus strategically and intentionally establishes a visible presence for Mason in a prestigious East Asian location and will enhance Mason’s reputation nationally and abroad,” Schiller said. Not only will the campus provide new opportunities for domestic Mason students and faculty, it will also expand Mason’s potential to recruit internationally. Among those opportunities are study-abroad experiences, internships and employment, research opportunities and Virginia, Korean and international business ties that contribute to economic development. While many believe this campus will enhance Mason’s initiatives to be a global and innovative campus, there are contradictory arguments. Rachel Bruns, a Global Affairs undergraduate student at Mason and 2011-12 Board of Visitors Student Representative, is one in opposition of this decision.